Welcome to this weeks Artisan Design Team blog hop! This week we are featuring the projects we shared on facebook for the month of March. You hopefully have arrived from the oh-so-talented Wendy Weixler's blog. If not, keep clicking on the button at the bottom of each blog post and hop to work your way back around. 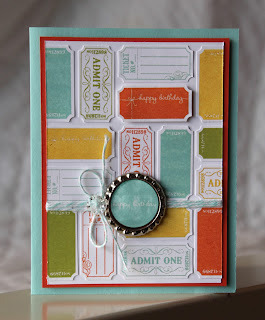 I was so excited to work with the That’s the Ticket Stamp Set; it’s one of my favorite sets in the spring catalog! For easy placement of the tags, I stamped each one on a piece of Whisper White Cardstock, then punched it out using the Ticket Duo Punch. It was much easier to lay out the pattern and have them all line up. I love the cheery, colorful look of this card. Thanks for stopping by today! Please continue on to Cindy's blog, she always makes the most beautiful cards!! I'm love, love, loving this card! I've already pinned it and am totally casing it! Thanks for the inspiration! Absolute GENIUS!!! The BEST!!! Can't even say ENOUGH good things about this one! !